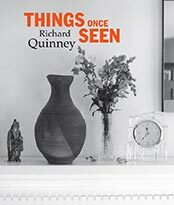 Things Once Seen received the 2009 August Derleth Award for nonfiction book by the Council for Wisconsin Writers. Photographs, these photographs of things once seen, are a reminder of the impermanence of all things. But what the photographer once saw and caught on film may be given another life when others see the photographs at a later time. For the photographer, the act of photographing has been an intimate part of the process of living a life. This body of work, accompanied by journal notes, is a record of what the photographer once saw, and is a window to the life once lived.